I have my personal favorite. Which is yours? Maybe I have seen your old plane ride out in the famous bone yards in the deserts of California and Nevada? Which defunct airline was your favorite back in the day? Aloha Airlines. – 53% This island based carrier kept Hawaiian and United from dominating, and kept prices low. Discovery Airways. – 0% Never heard of it. Have you? Mahalo Air. – 1% Island airline operated for a relatively short time, with great prices, and poor performance. Pan Am. – 18% This was the first great Asian carrier. Their blue travel bags are among the most popular with the Boomers. Continental. – 6% At one time, they had the best first class food of any domestic airline. Northwest Airlines. – 6% Never one of my favorites since their hubs were Minneapolis and Detroit. Trans World Airlines/TWA. – 4% Loved their upgrade policy, especially with mostly wide bodies, even on domestic flights. Western Airlines. – 4% Sort of a junky airline, using old planes, and mean flight attendants. My personal favorite was PSA or Pacific Southwest Airlines. I remember flying often to Los Angeles for $16 each way in the Seventies. 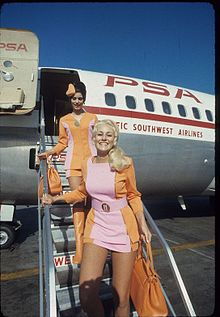 They were famous for their female flight attendants in pink and orange hot pants, free drinks, and on time performance. I think they were purchased by U.S. (Sc)air, and the hot pants found their way to the nearest Goodwill store. Another airline with a strange legacy was Hughes Air (Worst), actually, called Hughes Airwest, part of Howard’s empire. I was working on a research project for the Department of Health and Human Services (HHS) with an econ prof at Chico State. I had to take the morning puddle jumper from SFO to Chico. The plane then continued on its way toward Redmond, with several stops in way out places, like Bend, Red Bluff, and Medford. I then caught the plane on its return route. If I ever missed it, which I did not, I would be stuck in Chico for the night! Given that its name seems rather dangerous, Crashcade Airlines, in reality, Cascade Airlines in the Pacific Northwest, was never a favorite of mine. Once my buddy and colleague, Mort the Sport, used this nickname on me, I carefully avoided using it when trying to get to eastern Washington or points beyond. Here are some others that I have actually flown on: Air Berlin, Air Hawaii, America West (now USAir), Aspen Airways, Braniff, Capitol Airlines, Comair, Continental, Delta Express, Eastern, Frontier, National Airlines, Ozark, Piedmont, Rocky Mountain, Shuttle by United, Skyway, Song, TED, British Midland, Cambodia Airways, and Thai Airways. Thankfully, I am still here to tell about it!